Nick, Mel and Jamie at the currently dry Coalstoun lakes. The impact of recent climate change and humans on sensitive ecosystems in Australia is a hot topic. I have teamed up with researchers from the University of Adelaide and University of Queensland to combine our expertise to try and solve some of these questions. 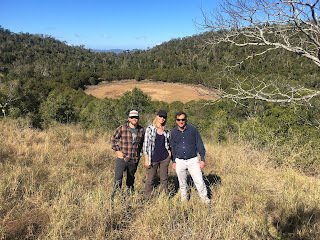 In August, I first went with researchers from University of Queensland to the Coalstoun Lakes area, North of Brisbane. 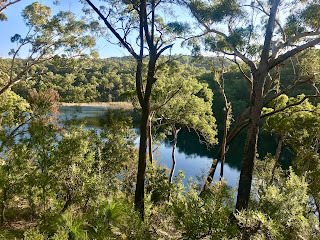 The Coalstoun lakes formed within old volcanic craters which last erupted 600,000 years ago (yet they are still amongst the youngest volcanoes in Australia). There is still evidence of the basalt lava around the craters. The track up the side of the dormant volcano runs through prickly shrubs and thicket, and the lakes area is a refuge for many birds (being surrounded by agricultural land). The forest around the crater comprises bottle trees, ash and tea-trees. Interestingly the two crater lakes were dry when we visited in August (dry/mid-winter), which is an unusual occurrence and may be an indicator that the lakes are at a critical point in their evolution (i.e. filling up with sediment) during a particular dry spell. We have taken cores of sediment through the lakebeds and plan to reconstruct past climates, and hope to better understand the causes of long-term variability of water availability in eastern Australia. This will help understand drought risk, critical for the sustainability of agriculture, the security of urban water supplies (especially for the greater Brisbane metropolitan area) and for power generation. 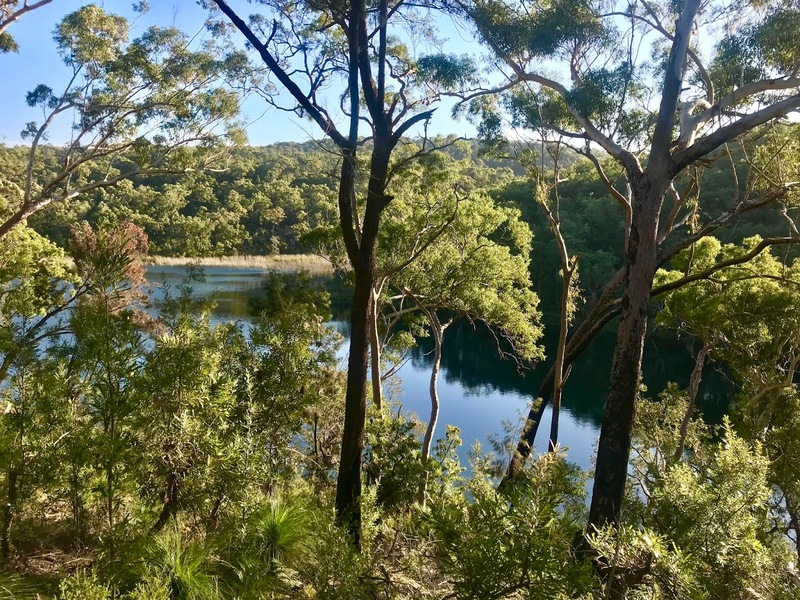 In addition, through improved understanding of the long-term ecological dynamics and human impacts at Coalstoun Lakes, this study will also generate improved management outcomes for Coalstoun Lakes National Park. This research is being led by PhD student Nick Patton who is based at University of Queensland but with supervisors at University of Nottingham and the British Geological Survey. Look out for Nick’s future blogs! Blue Lake on North Stradbroke Island. I then went back to Brisbane and took the ferry to North Stradbroke Island to meet with colleagues from the University of Adelaide. We visited Blue Lake (so called because the water quality reflects the sapphire colour of the amazingly clear blue skies). Blue Lake is thought to be untouched by human impact (due to its connection to a deep and extensive aquifer under the island). The theory being that Blue Lake sediments should provide information on centennial and millennial changes in the sources of rainfall over the eastern Australian continent. Ultimately, we need to understand where and when the aquifer was filled and current recharge rates in order to protect the ecology of the island and monitor human impact. This research is being led by Charlie Maxson who is a joint PhD student between the University of Adelaide, the University of Nottingham and the British Geological Survey. Look out for Charlie’s future blogs! Thanks to Prof Jamie Shulmeister and Nick Patton (both University of Queensland), and Associate Prof John Tibby, Dr Cameron Barr, Dr Jonathan Tyler and PhD students Haidee Cadd and Charlie Maxson (all University of Adelaide), as well as staff from the Queensland Department of Science, Information, Technology and Innovation for their collaboration. From L-R: Koala on North Stradbroke Island; A rare Barking Owl in Coalstoun Lakes National Park. Melanie Leng is the Director of the Centre for Environmental Geochemistry at the BGS and University of Nottingham. Follow Mel on twitter @MelJLeng.